FRESNO — David F. Zoldoske, director of the Center for Irrigation Technology at Fresno State, is the Irrigation Association’s Person of the Year. Zoldoske, who was honored at the 2013 Irrigation Show and Education Conference in Austin, Texas Nov. 7, is the fourth person from Fresno State to receive the award that honors a person outside of the commercial irrigation industry who has made outstanding contributions toward the acceptance of sound irrigation practices or policies. “Dr. Zoldoske joins a long list of distinguished previous winners from across the country and from other major agricultural universities,” said Dr. Charles Boyer, dean of the Jordan College of Agricultural Sciences and Technology. Based in Virginia, the Irrigation Association, is the leading membership organization for irrigation equipment and system manufacturers, dealers, distributors, designers, consultants, contractors and end users. Originally founded in 1949, it includes more than 2,000 corporate and individual members and is dedicated to promoting efficient irrigation. The Person of the Year Award was established in 1952. Winston Strong, professor of Plant Science and Mechanized Agriculture was recognized in 1974 for pioneering work in sprinkler testing. Former CIT directors Kenneth Solomon and Edward Norum were honored in 1990 and 2004 respectively. Fresno State has been involved in irrigation testing and research for more than 60 years and Zoldoske has been involved for more than half of that time. He started his irrigation career as a graduate student research assistant before beginning work as a full time research technician in 1983. He was named CIT director in 1994. Established at Fresno State in 2001 to improve water use efficiency, the Center for Irrigation Technology is internationally recognized as an independent testing laboratory, applied research facility and educational resource for water and irrigation technology. As director, Zoldoske works with the public and private sector to respond to a wide range of challenges including water use efficiency, water quality, economic development, regional planning and policy. Zoldoske also serves as vice-chair of the California Department of Water Resources Strategic Planning Caucus for New Water Technology, an effort that will become part of the state’s 2013 Water Plan Update. 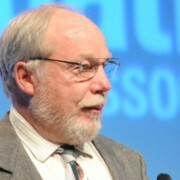 He is a past president of the Irrigation Association (2004-05); a member of the “Smart” Water Application Technologies Executive Committee; an honorary member of the American Society of Irrigation Consultants; a Fellow with the California Council for Science and Technology; and served as president of the American Society of Agronomy. Internationally, Zoldoske served as the project leader in establishing the Zimbabwe Irrigation Technology Centre and has represented the United States in the development of international standards.